To RSVP or for more information, email us. The Flying Eagle Woman Fund, based in New York, was created to commemorate and further the work of Ingrid Washinawatok El-Issa (1959–1999). Ingrid, a member of the Menominee Nation, was among the most promising Native leaders of her generation. Activist, writer, spokeswoman, educator and director of a Philanthropic foundation, she devoted her life to the cause of indigenous peoples around the world. The Fund’s primary mission is to strengthen the sovereignty of indigenous peoples by building communities that are politically and economically self-reliant, while striving to maintain and reinforce their traditional culture and ways of life. 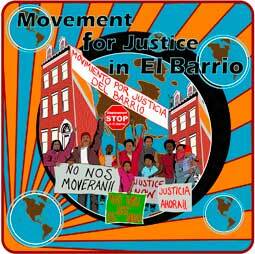 Founded in 2004, Movement for Justice in El Barrio is a majority-women, immigrant-led, grassroots community organization that fights for dignity and against neoliberal displacement in East Harlem and beyond. At over 850 members, Movement has built a bottom-up struggle for justice and liberation that operates on a commitment to participatory democracy, self-determination, and autonomy. The North End Action Team in Middletown, CT evolved in 1996 from a city-sponsored Urban Homesteading Task Force, begun in response to widespread concerns about negative conditions in the city’s North End. Resident activists and organizers believed that a grassroots effort should be undertaken to develop resident-driven leadership to assess problems, determine priorities, and develop solutions to neighborhood issues.